In the power supply described in this post, I took out the high-voltage transformer out of its metallic enclosure to isolate the center tap from ground. 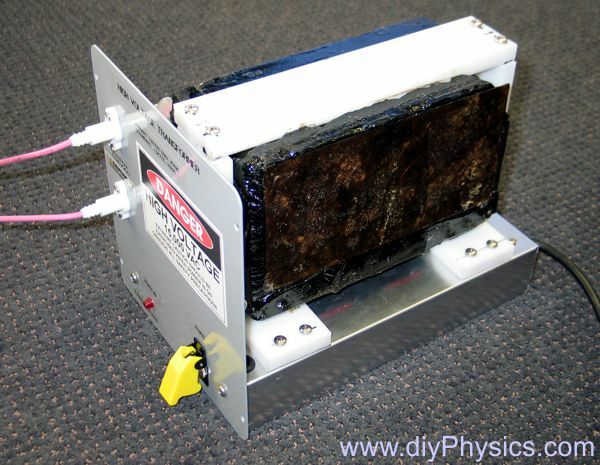 This requires very careful application of a thick insulated layer to the transformer. I used a full can of Shellac to patiently coat and re-coat the transformer. I built a thick Delrin insulating bracket for the modified transformer, and placed it inside a grounded metallic enclosure. I wired it using high-voltage cable that is further insulated by thick silicone tubing. I liberally use high-voltage putty (GC ELECTRONICS # 10-8882) for insulation. I purchased the high-voltage connectors at Surplus Sales of Nebraska. 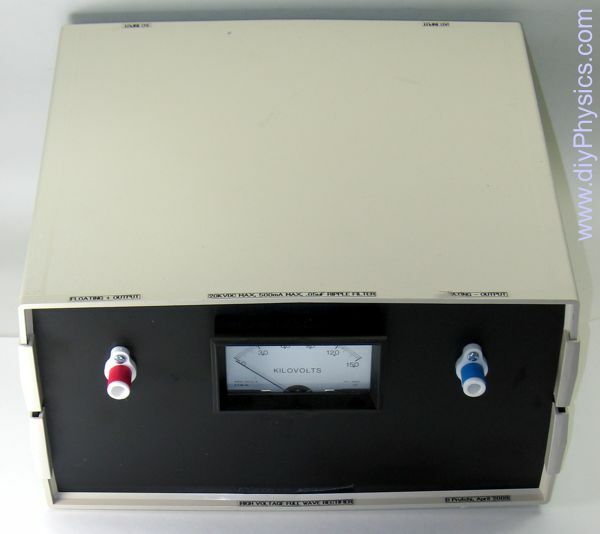 To obtain a variable AC output, I use a 500 W variac. 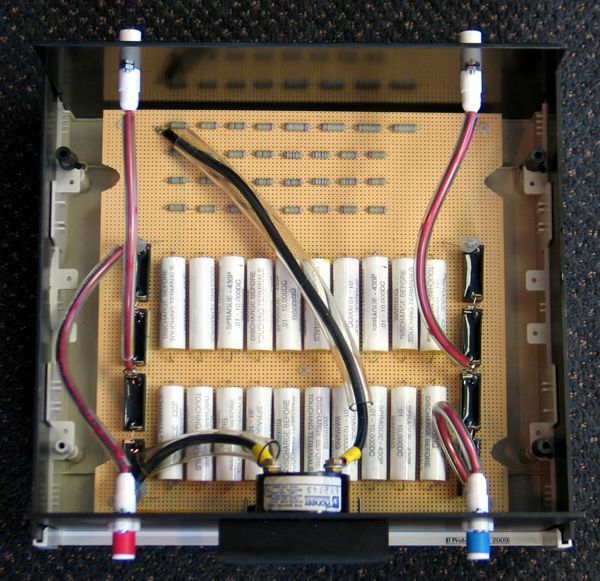 It must be remembered that neon-tube transformers are commonly designed to first produce a voltage spike to start discharge in the gas, and then enter constant-current mode. As such, the voltage will vary quite a bit depending on the load. A one-to-one voltage relationship between the variac’s output (the input to the neon transformer) and the neon transformer’s output is only possible for very light loads. Floating DC output is generated by full-wave rectification and filtering of the neon transformer’s output. I used eight NTE542 high voltage diodes (commonly used in small microwave ovens) to build a full-wave-bridge rectifier as shown in the schematic diagram above. Twenty 0.01 uF @ 10 kV capacitors are used to filter the rectified voltage. I used a surplus panel meter (labeled in kV, probably from an X-ray machine) with a string of resistors to measure the output voltage. 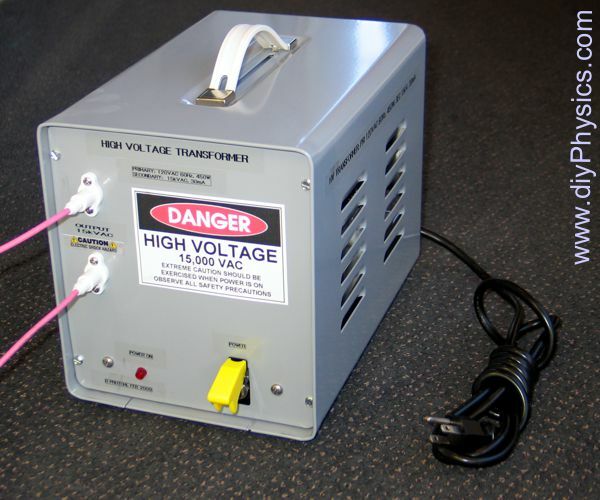 I originally built this power supply to run a Chinese DC-powered CO2 laser tube, but it has proven to be a great addition to my collection of high-voltage power supplies for running my plasma generator. DANGER! Please note that this is a dangerous device! It produces high voltages which can cause very painful or lethal electrical shocks. In addition, spark discharges can be produced which can ignite flammable materials or volatile atmospheres. Remember that the capacitors retain charge long after the power supply is switched off. Thoroughly discharge them before touching the high voltage rails! For a somewhat beefier CO2 laser power supply built along the same lines, I built an unregulated 2kW 20kVDC power supply (http://eskb.weebly.com/2kw-power-supply.html). The current regulation happens elsewhere, though (http://eskb.weebly.com/current-regulator.html). Thanks Dr Prutchi for the great resource! Thanks for the post ! 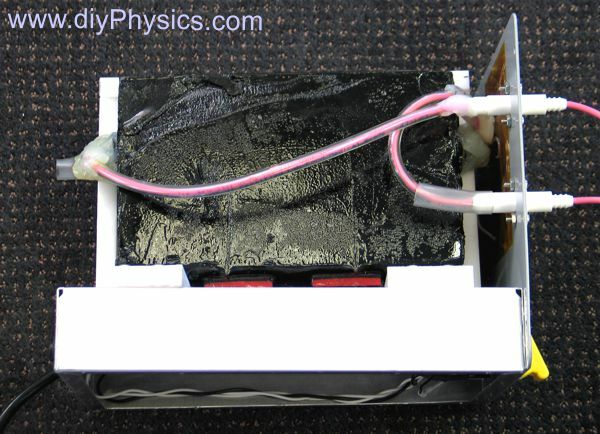 I found this very useful as I came across an old working neon transformer in my search for a low cost ac hv supply. Your tutorial was of great help. I was wondering if your variac is rated specifically for high voltage ? I have a 250W variac (rated for 250v) , and my transformer is rated for 225VA, but its secondary is 7500V @ 30ma. I am wondering if i could still use the 250W variac ? Probably the risk is dielectric breakdown, so maybe if i can wrap it in some high insulation shellac ? Would appreciate your thoughts on the subject. The variac is standard. The isolation barrier of concern is between the ** FLOATING ** high-voltage secondary and the primary of the neon transformer. i am using a bipolar amplifier (kepco bop) to feed into the transformer, so that in a sense acts as my variac since i can vary the gain. I need this so that i can vary the frequency at the transformer’s output. The problem is that kepco bop is both expensive (1000$) and very heavy (~30-40lb). I am wondering if you have experimented with a similar configuration. No, I haven’t tried driving a neon transformer from an amplifier. I would actually be worried about damaging the expensive amplifier with HV that may leak or arc from the neon transformer. I would suggest that you find a cheap variac instead of risking the amp. I have tried to make a DC power pack by a neon transformer and found same problem regarding to center tapped design. They usually connect one end of both secondary windings to core. Why this arrangement makes problem for rectifying even after removing core connection to ground? Could you please help me understand it? The center tapped design is to prevent any area of the secondary to float to full voltage. It is more expensive to make a secondary insulated to 15 kv to ground than to insulate the whole thing to 7.5 kv to ground (centertapped). Clearly that also has safety implications regarding maximum arc length to ground and isolation.